This study aims to utilize body composition monitor (BCM) device to achieve euvolemic status in problematic dialysis patients and to evaluate its clinical outcome. One hundred and five hemodialysis (HD) patients were enrolled based on difficulty in achieving dry weight. The reasons for enrollment in the study were (a) recurrent intradialytic hypotension, (b) intradialytic hypertension, (c) intradialytic muscle cramps, or (d) the presence of comorbid conditions that make clinical assessment of dry weight difficult (e.g., cirrhosis of liver, heart failure, severe malnutrition, or morbid obesity). Following initial assessment of hydration status using BCM device, dry weight for each patient was adjusted accordingly (upward, downward, or unchanged). The patients were, thereafter, monitored over a 15-week period for possible resultant change in the clinical and hemodynamic parameters. Forty-two patients were monitored due to hypertension, 18 due to hypotension, 10 due to hypotension and cramps, and 35 due to comorbid conditions that make clinical assessment of dry weight difficult. At the conclusion of study period, there was improvement in the monitored parameters. Hypertension improved in 79% of the patient with hypertension, hypotension in 90%, and hypotension with cramps in 90%. In the comorbid group, BCM monitoring provided better insight to clinical problem management in 80% cases. Overall quality of BCM assessments was 96.1%. In the hypertension group, mean blood pressure decreased by 10.9 mm Hg in the whole group (P = 0.0006), the drop was 3 mm Hg in the patients dialyzing with HD (P = 0.0006) and 8.6 mm Hg in those on hemodiafiltration (HDF) (P = 0.08). In the comorbid conditions group, the mean blood pressure rose by 22.5 mm Hg in the whole group (P 0.00001), 21.5 mm Hg in the patients dialyzing with HD (P = 0.00001) and 21.5 mm Hg in those on HDF (P = 0.0004). BCM monitoring together with clinical assessment is a useful tool which when appropriately applied reduces the incidence of dialysis-related complications. Volume status assessment is an important aspect in the day-to-day management of the dialysis patients. Persistent hypervolemia leads to hypertension, ventricular hypertrophy, and ultimately congestive heart failure. Loss of renal function and high intake of salt and water result in high intradialytic weight gain and hypertension. Approximately 80% of hypertension in dialysis patients is related to hypervolemia,,, and high blood pressure contributes to the higher rate of cerebrovascular and cardiac adverse events.,,,,, Hypervolemia has been shown to be associated with increased mortality among hemodialysis (HD) patients. Dry weight in dialysis patients is a variable entity which implies a state of near euvolemia. Usually, the nephrologists rely on their clinical assessment of the patient (lying and standing blood pressure, pulse rate, JVP examination, absence of cramps and dizziness, dependent edema and fluid in body cavities, e.g., ascites). However, there are limitations in this clinically based assessment tool. For example, significant fluid overload may be present but not clinically evident. Conversely, overzealous fluid removal may result in hypotension. Almost 20% dialysis sessions are complicated by hypotension. This causes multiple problems to the patient such as nausea, vomiting, decreased efficacy of dialysis, and coronary hypoperfusion. Intradialytic hypotension has been found to be associated with cardiovascular morbidity and mortality. Achievement of normovolemia in HD patients is of major clinical and prognostic significance. The usually used clinical assessment of volume status in these patients is crude. Other more objective tools that have been used have their limitations also. Using dilution methods to measure extracellular and total body water is the gold standard but is expensive and labor intensive. Assessment of the inferior vena cava diameter ultrasonically evaluates the intravascular volume only and may be affected by things other than the volume status such as diastolic dysfunction. Another technique that has been utilized recently to assess fluid status is by bioimpedance spectroscopy. In this method, resistance and reactance can be evaluated by measuring the flow of electrical current through the body at different frequencies. The aim of our study was to assess if BCM monitoring (together with clinical assessment) can help achieve dry weight and reduce dialysis-related adverse events. We performed a prospective cohort study in 105 patients on HD at King Abdullah HD Center between April 1, 2017, and July 20, 2017. After obtaining informed verbal consent, BCM monitoring was done in addition to clinical assessment to guide in determining and achieving dry weight. Patients were identified and selected for the study by the nephrologist based on the fact that despite multiple clinical assessments, the patients remained symptomatic with (a) recurrent intradialytic hypotension, (b) intradialytic hypotension, (c) intradialytic hypotension accompanied by muscle cramps, or (d) the presence of comorbid conditions that make clinical assessment of dry weight difficult, namely cirrhosis of liver, heart failure, severe malnutrition, or morbid obesity. Patients with cardiac pacemakers, metallic joint prosthesis, or metallic orthopedic implants were excluded from this study. All the enrolled patients received thrice weekly 4-h HD sessions. Sixty-three patients received standard HD and 42 patients were on hemodiafiltration (HDF). All patients were dialyzed with Fresenius 5008 S Cordiax machine with high-flux dialyzers. The patients' blood flow ranged from 250 to 450 mL/min. The patient's fluid status and dry weight were assessed clinically (lying and standing blood pressure, pulse rate, JVP examination, absence of cramps and dizziness, assessment of dependent edema, and fluid in body cavities, e.g., ascites). All patients were evaluated by BCM monitor (BCM, Fresenius Medical Care M491131) as per manufacturer's guidelines by two trained nursing staff before dialysis. The results were documented and shared with treating physicians who adjusted the dry weight (DW) in light of their clinical assessment and BCM result. Patients were classified as either over hydrated, normal hydration, or hypohydrated as shown in [Figure 1]. 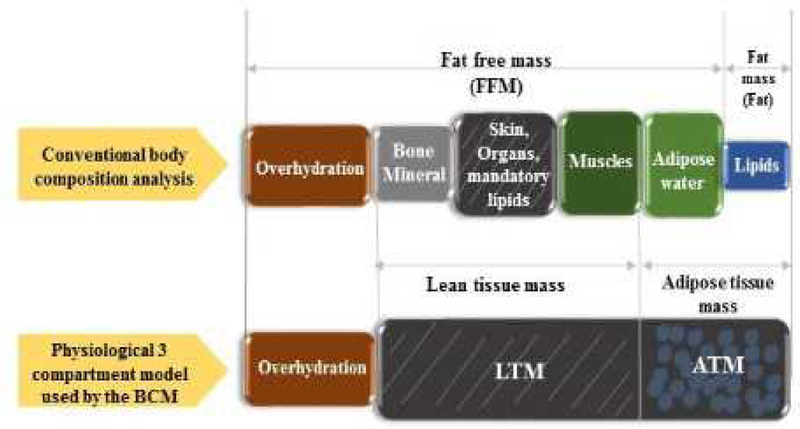 Figure 1: Classification of hydration status. One hundred and five patients (61 males and 44 females; age range of 22 to 83 years) underwent a total of 637 assessments. The clinical and demographic data are shown in [Table 1]. Table 1: Clinical and demographic data. 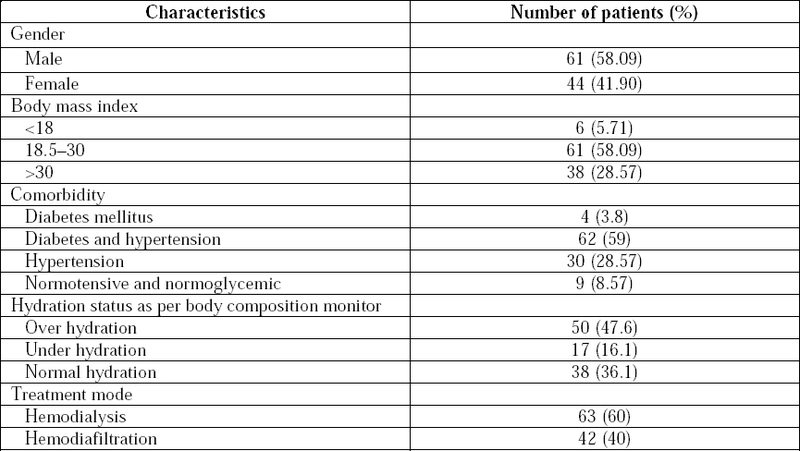 The indications for enrollment to this study were hypertension in 42 patients, intradialytic hypotension in 18 patients, intradialytic hypotension and cramps in 10 patients, and comorbid conditions that would interfere with clinical assessment of dry weight in 35 patients [Table 2]. Table 2: Indications for enrollment in the study, dry weight adjustment direction, and positive outcome. In the hypertensive group, the dry weight decreased in 61.9%, increased in 9.5%, and unchanged (but antihypertensive medication adjusted) in 28.6%. In this group, hypertension improved in 79% patients [Table 2]. In the 18 patients who experienced intradialytic hypotension, dry weight was increased in 77.8% and decreased in 5.6% and unchanged in 16.6% [Table 2]. An improvement occurred in 90% of these group patients [Table 2]. In the group with intradialytic hypotension with cramps (10 patients), dry weight was increased in 90% of patients and decreased in 10% of patients. There was improvement in 90% of patients in this group [Table 2]. In the group with comorbid conditions that would interfere with DW assessment (35 patients), the dry weight was increased in 11.42% of the patients, decreased in 40% of the patients, and unchanged in 48.58% of patients. There was a clinical improvement in 80% [Table 2]. Overall, all parameters showed improvement in the monitored group. The changes in mean values of the mean blood pressure as result of BCM intervention in the hypertension and comorbid conditions groups are shown in [Table 3]. This value is shown in all the patients, in those treated with HD and in those treated with HDF. Table 3: Changes in BP in the hypertension and comorbid conditions groups as a result of BCM intervention. In the hypertension group, the mean blood pressure decreased by 10.9 mm Hg in the whole group (P 0.0006) and by 3 mm Hg in the patients dialyzing with HD (P = 0.0006) and by 8.6 mm Hg in those on HDF (P = 0.08). In the comorbid conditions group, the mean blood pressure rose by 22.5 mm Hg in the whole group (P = 0.00001) and by 21.5 mm Hg in the patients dialyzing with HD (P = 0.00001) and by 21.5 mm Hg in those on HDF (P = 0.0004) [Table 3]. Establishing and maintaining dry weight in chronic HD patients is a difficult task. Dialysis patients vary in their dietary habits and fluid intake. In an individual patient, there is sometimes considerable changes in fluid status from one dialysis to another because of dietary indiscretions. Clinical assessments alone such as chest auscultation, examination of JVP, or detection of pedal edema are not always sufficient as these are subjective assessments. As a consequence of limitations in assessments, patients are prone to intradialytic hypotension which has been shown to increase morbidity, mortality, and decreased survival in dialysis patients., Intradialytic hypotension has been reported to be associated with frontal lobe atrophy in chronic HD patients. Conversely, overhydration in chronic HD patients is also associated with higher mortality. In our study, BCM monitoring resulted in significant improvement in symptoms attributable to over or under hydration status. The incidence of both hypertension or hypotension and cramps decreased significantly in our patients. The significance of these findings are important as this is expected to lead to less hospital referrals, admissions, and interruption of dialysis treatments and generally lead to improved patients' quality of life. This aspect is particularly significant in the context of outpatient satellite dialysis centers. BCM monitoring is a convenient noninvasive technique which if performed by trained nursing staff can yield good results as regards management of hydration status of dialysis patients. In one study, using BCM to evaluate fluid status in 52 HD patients, it was found that in the overhydrated group, fluid overload was significantly reduced by a mean of 2.0 L without the occurrence of intradialytic complications and with a concomitant significant reduction in systolic blood pressure of 25 mm Hg and in anti-hypertensive medication. In the group with intradialytic adverse events, the fluid status was significantly increased by a mean of 1.3 L with a concomitant significant reduction of intradialytic adverse events in 73% of the patients without significantly increasing the blood pressure. Limitations of our study include exclusion of patients with cardiac pacemakers or metallic prosthetic implants. Including of patients with limb amputation would have been more informative as this is a special group of patients in whom clinical assessment of dry weight can be very challenging. In addition, more number of post-HD BCM assessments would have given a better insight. We can conclude that BCM monitoring in conjunction with clinical assessment is a safe noninvasive method which if properly applied can result in reduction in the incidence of clinically significant dialysis-related complications. Kuhlmann MK, Zhu F, Seibert E, Levin NW. Bioimpedance, dry weight and blood pressure control: New methods and consequences. Curr Opin Nephrol Hypertens 2005;14:543-9. Lins RL, Elseviers M, Rogiers P, et al. Importance of volume factors in dialysis related hypertension. Clin Nephrol 1997;48:29-33. Fishbane S, Natke E, Maesaka JK. Role of volume overload in dialysis-refractory hypertension. Am J Kidney Dis 1996;28:257-61. Cheigh JS, Milite C, Sullivan JF, Rubin AL, Stenzel KH. Hypertension is not adequately controlled in hemodialysis patients. Am J Kidney Dis 1992;19:453-9. Goldberg AP, Tindira C, Harter HR. Coronary risk in patients with endstage renal disease: Interaction of hypertension with hyperlipidemia. J Cardiovasc Pharmacol 1982;4 Suppl 2:S257-61. Kannel WB, Gordon T, Offutt D. Left ventricular hypertrophy by electrocardiogram. Prevalence, incidence, and mortality in the Framingham study. Ann Intern Med 1969;71: 89-105. Parfrey PS, Harnett JD, Griffiths SM, Gault MH, Barré PE. Congestive heart failure in dialysis patients. Arch Intern Med 1988;148: 1519-25. Parfrey PS, Foley RN, Harnett JD, et al. Outcome and risk factors for left ventricular disorders in chronic uraemia. Nephrol Dial Transplant 1996;11:1277-85. Agarwal R. Hypervolemia is associated with increased mortality among hemodialysis patients. Hypertension 2010;56:512-7. Chazot C, Wabel P, Chamney P, et al. Importance of normohydration for the longterm survival of haemodialysis patients. Nephrol Dial Transplant 2012;27:2404-10. Mann H, Stiller S. Sodium modeling. Kidney Int Suppl 2000;76:S79-88. Stiller S, Bonnie-Schorn E, Grassmann A, Uhlenbusch-Körwer I, Mann H. A critical review of sodium profiling for hemodialysis. Semin Dial 2001;14:337-47. Stefánsson BV, Brunelli SM, Cabrera C, et al. Intradialytic hypotension and risk of cardiovascular disease. Clin J Am Soc Nephrol 2014;9:2124-32. Woodrow G. Body composition analysis techniques in adult and pediatric patients: How reliable are they? How useful are they clinically? Perit Dial Int 2007;27 Suppl 2:S245-9. Jacobs LH, van de Kerkhof JJ, Mingels AM, et al. Inflammation, overhydration and cardiac biomarkers in haemodialysis patients: A longitudinal study. Nephrol Dial Transplant 2010; 25:243-8. Sommerer C, Heckele S, Schwenger V, et al. Cardiac biomarkers are influenced by dialysis characteristics. Clin Nephrol 2007;68:392-400. Kotanko P, Levin NW, Zhu F. Current state of bioimpedance technologies in dialysis. Nephrol Dial Transplant 2008;23:808-12. Davies SJ, Davenport A. The role of bioimpedance and biomarkers in helping to aid clinical decision-making of volume assessments in dialysis patients. Kidney Int 2014; 86:489-96. Chen YC, Chen HH, Yeh JC, Chen SY. Adjusting dry weight by extracellular volume and body composition in hemodialysis patients. Nephron 2002;92:91-6. Agarwal R, Andersen MJ, Pratt JH. On the importance of pedal edema in hemodialysis patients. Clin J Am Soc Nephrol 2008;3:153-8. Shoji T, Tsubakihara Y, Fujii M, Imai E. Hemodialysis-associated hypotension as an independent risk factor for two-year mortality in hemodialysis patients. Kidney Int 2004; 66:1212-20. Chou JA, Kalantar-Zadeh K, Mathew AT. A brief review of intradialytic hypotension with a focus on survival. Semin Dial 2017;30:473-80. Mizumasa T, Hirakata H, Yoshimitsu T, et al. Dialysis-related hypotension as a cause of progressive frontal lobe atrophy in chronic hemodialysis patients: A 3-year prospective study. Nephron Clin Pract 2004;97:c23-30. Wizemann V, Wabel P, Chamney P, et al. The mortality risk of overhydration in haemodialysis patients. Nephrol Dial Transplant 2009;24:1574-9. Scotland G, Cruickshank M, Jacobsen E, et al. Multiple-frequency bioimpedance devices for fluid management in people with chronic kidney disease receiving dialysis: A systematic review and economic evaluation. Health Technol Assess 2018;22:1-38. Ponce P, Pham J, Gligoric-Fuerer O, Kreuzberg U. Fluid management in haemodialysis: Conventiona versus body composition monitoring (BCM) supported management of overhydrated patients. Port J Nephrol Hypertens 2014;28:238-48.